The story started one freezing and wet New York City evening in 1903. Mary Anderson was a passenger in a trolley, sitting in traffic, and happened to notice the driver has having a hard time seeing through the icy windshield. The windshield of the trolley was split into separate parts so the driver was able to open them to help improve the driver’s line of vision. On the contrary, it exposed the drivers face, along with the front riding passengers to the terrible weather outside! On top of this, there was only way open and close these windows – The driver had to frequently stop the vehicle to reach through each window to wipe the sleet and snow by hand, which caused even further delays. Opposing from improving the driver’s line of sight, the driver couldn’t see anything at all. Mary Anderson had her “light bulb” moment right then and there and started working on her first sketches in the trolley. After numerous sketches and attempts of a prototype, she finally came up with something that worked. The prototype wiper arms were made of wood and rubber, attached to a lever on the driver’s side next to the steering wheel so the driver would no longer have to stick their hands outside. When the lever was pulled, it dragged the arms across the window and a spring pulled them back to their starting position. She also designed them so that once the rainy season was over, the wipers could be removed from the vehicle and stored until needed again. The application for the patent was filed on June 18, 1903. On November 10th, 1903, Mary Anderson was awarded the United States Patent 743,801 for her “Window Cleaning Device”– The Windshield Wiper! Once she received the patent for her invention, she tried to sell it to a Canadian manufacturing firm. Unfortunately, the company refused the device due to “It had no practical value” and therefore, was not worth any money. People also thought the wipers’ movement would distract the drivers line of sight and could cause accidents. She was thought to be ahead of her time as most cars did not drive fast enough to need windshields, let alone windshield wipers. Though mechanical windshield wipers were considered a “standard” piece of equipment on passenger cars around 1913, Anderson unfortunately never profited from the invention. Her patent even expired before she could persuade anyone to use her brilliant idea! Fortunately, she did live another 50 years, which was long enough to see Windshield Wipers as a safety standard for most vehicles. I’m sure she would be super stoked to see they are now a legal requirement on ALL vehicles! Thankfully, in 2011, she finally received the long overdue credit deserved and was inducted into the Inventors Hall of Fame. 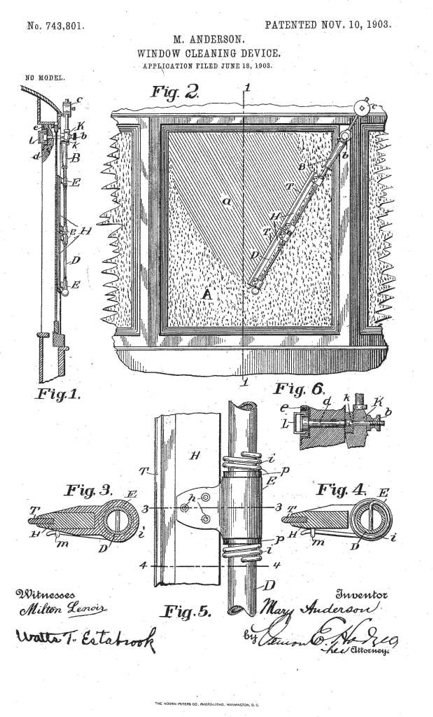 Now thanks to Mary Anderson’s idea in 1903, Billy Westbrook, the founder of Scrubblade, was able to obtain his OWN U.S. Patent for a “Wiper Blade Cleaning Glass or Polymetric Windshields” in 2010. We’re pretty sure Mary Anderson would be impressed by his 2-part cleaning system and tiny, triangular scrubbers on all Platinum and Heavy Duty Scrubblades!